Essay highlights the trends globally to a less dollar-centric world, with China's currency becoming more competitive to the U.S.$ .. "Could gold also begin to emerge as a leading currency in world trade? Over time, it certainly could. 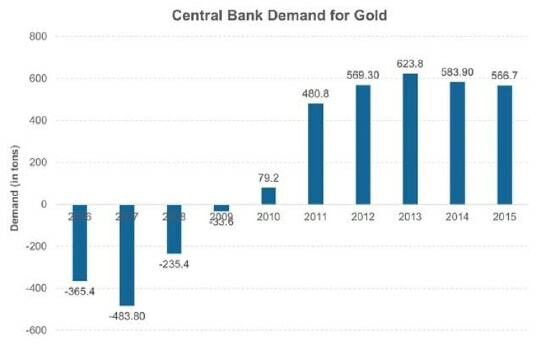 But the more immediate implications for gold’s monetary role center on its increasing accumulation by central banks such as China’s. Chinese leaders aim to be regionally dominant. In order to secure that position they are moving to own and control greater shares of the gold market. The recently opened Shanghai Gold Exchange gives China a direct mechanism for controlling the physical gold market in Asia. It’s a way for China to take at least some control away from Western governments and banks that have traditionally dominated the gold trade out of London and New York .. When the Chinese yuan becomes an SDR currency this fall, that could be the inflection point for a new multi-polar currency regime that sees the Federal Reserve Note decline in stature as central banks scramble to stock up on the ultimate money: gold."